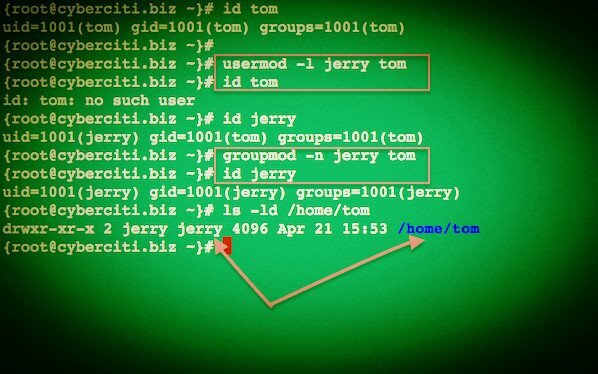 How do I change user name (rename user name) or UID under a Linux operating system using command line tools? You need to use the usermod command to change user name under a Linux operating systems. This command modifies the system account files to reflect the changes that are specified on the command line. 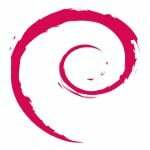 Do not edit /etc/passwd file by hand or using a text editor such as vi. The name of the user will be changed from the old-name to login_name. Nothing else is changed. In particular, the user’s home directory name should probably be changed to reflect the new login name. Let us see how to rename user login. First, make sure user name is not logged into the server and any other process is not running under the same user name. I also recommend that you backup any data or server files before changing user names. Read man pages of usermod(8) and groupmod(8) commands for more information. gave me exactly what I was looking for. Thanks. You might want to mention the possible additional tasks required to make a complete username changeover, such as changing the home directory name, the mail spool file name, or the group names. Otherwise an unexperienced sysadmin might use this command but break the user’s mail or other services. man usermod – we can view all details about user modifications and Changes. 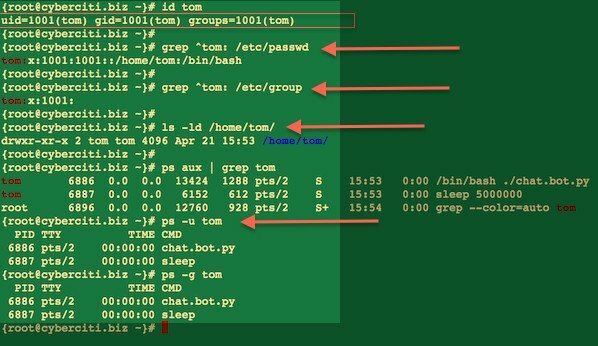 /etc/passwd – we can view all user ang group accounts, timestamps , bash. usermod -c – to change the jickos..,field..
As with any potentially dangerous operation, you should back up the user’s data before the migration. This will allow you to recover from the situation should the problem arise. Can we creat a user with the root permissions? if yes please explain how? I know root has 0 UID but when i try to assign 0 to any other user it gives me message that id is not unique. 5. If you don’t want to use the visudo command, you could just use a text editor and edit the /etc/sudoers file. but could you help me with saving the file? When I’m on terminal and have written all the needed modifications, how do I save and exit? ok mine challenge is different.i want to change from root to a user name. i have tried all i know how. Use the ‘-h’ switch to chown so that it updates the ownership of symbolic links rather than what the symlink points to. this handles files with spaces, backslashs or quotation marks correctly. Thank you! That works great!! its leads to a gconf error on rhel 5. UX: useradd: ERROR: Inconsistent password files. See pwconv(1M). Maybe you saved my life :P, thank you :). This happened even when I was changing “old” to “new” from a different user account while “old” was logged out. If you receive the error “usermod: user is currently logged in”, this is probably because you’re trying to change a username while their account is being used by one or more processes. First we become root, then we execute a command via nohup that will wait 30 seconds and then call the usermod command. Then log out of root and log out of your user account, and wait 1 minute. Then you should be able to log back in as your new user name. It seems that you must restart your system in Ubuntu 10.04, login to the different user account and do the changes. Once you were logged in to the account to be changed, it will not work anymore. No idea why. BTW: if you use WINE, look at the .reg files of WINE and change your /home folder name accordingly – or you will seriously bork Wine! Wow just what I was looking for thanks. I killed all his tasks. It works. What’s the terminal file in unix ? I want creat a user have id = 0. how can I do it?? when I delete dir home of user I can’t login this user. Why? guys, I made a adjustment in sudoers file and deleted the % in the group section. afterwards i cannt access the sudoers file anymore. error my user do not have the permission to access. I want to rename the username in particular file. how to change the username..I don’t no old username…. A system has an existing user kkline for Kathy Kline but she just got married and is now Kathy Morgan. You need to change her username, home directory name, and real name on the system. What command(s) would you use? Amazing response. That guided me through perfectly with just what i needed. Best strait to the point response! Thank you! When i change the user name then automaticaly change the group name also. I just only change the user name. How can i do that? I edited both the passwd and group file. Did you also edit /etc/shadow and /etc/gshadow? Also make sure your new username/group is in sshd_config for allowed groups. usermod not found? so i am using a zsh and i can’t find usermod, its not even in man â€” can’t find it in bash either. am i missing something? I can login, I can access files in home, but ALL of my desktop, settings and home files are gone. Back to square 1, with only 1 clue in my new home folder: two files by the name of README and *Access-Your-Private-Data.desktop*. UID `1000` has not changed even though the username changed. OLD was the user `1000`, as was `OLD` the home directory name. I changed the username to `NEW`, same UID (`1000`), and changed `OLD` group name to `NEWG1`. I did all of this from command line, by hitting `Ctrl+Alt+F1` from the login screen, then logging into a secondary account (not the `OLD` or the `NEW` account). – How do I access the encrypted files and move, delete or alter them? name (and even assign user to folder), and copy everything? – If it’s not encrypted, where did it all go? – Can I keep going and get it fixed with `NEW` everything? – Or, Can I backtrack properly to `OLD` everything? I looked in `/media/OLD`, but nothing is in there. I looked in `/tmp` but nothing like ‘*ecryptfs.123XYZ*’ is in there except *ssh-123XYZ* and *hsperfdata_NEW*. But again, this is not working for me. I am setting up a boot USB with Ubuntu 14, in hopes to follow directions on mounting properly (as in described here: http://ubuntuforums.org/showthread.php?t=1810825), but I am not sure I am working correctly. Thanks in advance! This is amazingly important to recover my old setup, regardless of damn username and home folder name. Please help with this if you can. Perfect! Very helpful. I followed the steps to change username, group, and home folder. Worked like a charm. Thank you so much Vivek! Mention killing of processes before mentioning usermod -l login-name user-name. It executed usermod -l, before killing processes. It was giving trouble. But thankfully, I reverted to previous username, killed processes and started afresh. That worked.